This parable of the woman who lost one silver coin out of ten, causing her to light a lamp, sweep the house, and search for it, describes a woman wearing 10 silver coins bound on her forehead as a dowry. This is why she is so urgent to find that piece of jewelry. In many villages,even today, in the Middle-East ie. in Turkey, we still find the ceremony of binding the head performed on the first day of the young bride's womanhood in the presence of invited female guests. 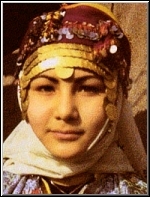 In some regions the bridegroom's family presents the bride with a headdress decorated with gold coins. This becomes the bride's personal property and forms a financial support for the new family, as it can be changed into money in time of need. It also serves as an indication of the woman's financial status. The silver ornaments on the headdress are in the nature of a talisman against evil and misfortune, and serve to preserve the wearer's health and strength. If the bride used the money without the husband's knowledge and approval, it reflects badly onher and the husband can chose to divorce her. When the Pharsiees and the scribes questioned Jesus about eating with the tax collectors and sinners, Jesus, in typical Hebraic fashion, gave them graphic explanation with this illustration. Imagine, if you were the woman who lost one of your "treasured" possession - a gift from a loved one. How would you really feel... while you search for the lost item and when you finally find it. Truly, a feast is in order. Now, with the same emotions, imagine Jesus seeking each one of us out. He doesn't see the tax collector or the sinner in you and me. In the same likeness of that "precious" possession in His parable, He looks for us, with the same concern and urgency, as the woman with the coin.